In days gone by there were separate bakers for cakes and cookies, sugar work, bread and pies in the Netherlands. According to well-known Amsterdam patissier Cees Holtkamp, taai-taai was a "typical cake baker's recipe." 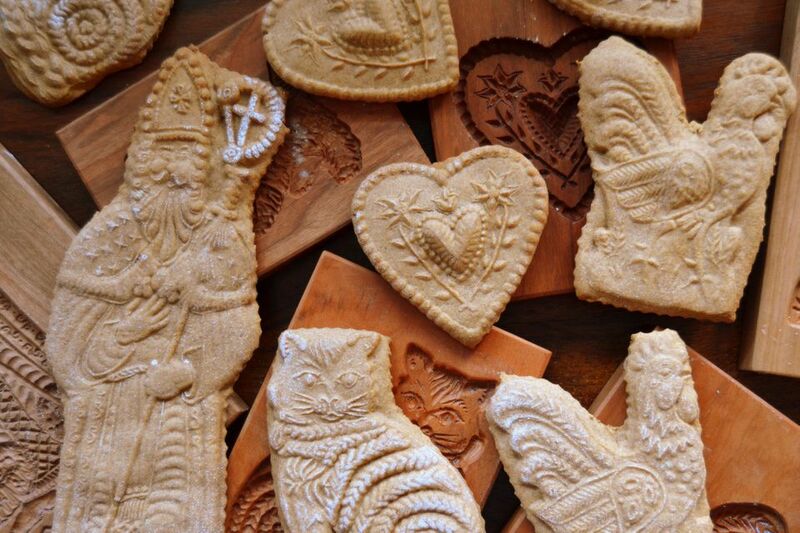 Literally translated as "tough-tough," these traditional Sinterklaas cookies owe their typical chewy texture to honey. They are often made in beautiful festive molds and taste of aniseed. You will notice that the recipe is somewhat similar to that of pepernoten. That's because pepernoten were often made from leftover taai-taai dough. We've translated and adapted the following recipe from the original Dutch in Koekje cookbook. It has been republished on this site with the permission of the publisher. While we've converted the recipe to US measurements, please keep in mind that this is a famous patissier's precision recipe, and you'll get the best results using a kitchen scale and the original European measurements which we've provided. Add 7/8 cup/170 grams of the brown sugar to a saucepan along with the honey and 1/3 cup/80 grams of the water. Bring to a boil. Remove the saucepan from the heat and stir in both types of flour and the salt. Allow the dough to rest for 1 day, covered, at room temperature. Mix in the remaining 1 1/2 tablespoons/20 grams of bruine basterdsuiker, ground aniseed, the remaining 1 1/3 tablespoons/20 grams of water and the baking powder, and mix. Turn the dough out onto a floured surface and roll it out to 1/2-inch/1 centimeter thick. Preheat the oven to 410 degrees F/210 degrees C.
Cut the dough into shapes using a (lightly floured) figurine mold or cookie cutter and place on a lightly greased baking sheet. Brush the shapes with the beaten egg. Bake the taai-taai in the preheated oven for 12 minutes. Basterdsuiker is a typical Dutch product and cannot be substituted easily. It is manufactured by adding invert sugar and other ingredients to fine white refined sugar. This mixture helps to achieve certain textural structures and keeps baked goods moist. There are three varieties, white, brown and dark brown, called witte basterdsuiker, (licht)bruine basterdsuiker or gele basterdsuiker and donkerbruine basterdsuiker. It is widely available at Dutch supermarkets and from some Dutch groceries on the internet. Zeeuwse bloem is a finely milled white Dutch cake flour, made from soft wheat. It is described by Holtkamp as "a flour rich in enzymes and low in gluten, which is very pliable and elastic in nature." According to the patissier, this makes the flour suitable for cookies that have to be ultra light and crispy. Zeeuwse bloem can be ordered from most bakeries in the Netherlands. Alternatively, go to a good baker where you live and tell them you need a finely milled white flour, made from soft wheat, suitable for cookies. Because ground aniseed loses its flavor quickly, we advise buying this spice whole and crushing them just before you need them. Use a spice grinder, a mortar and pestle, or place the spices in a bag and bash with a rolling pin. Sieve and use only the fine powder in this recipe. Which Are the Best Dutch Desserts? Did You Know that Dutch Pretzels are Sweet? Here's the Recipe. Go Nuts! Bake a Batch of Crunchy Pindakoeken Today!